Research objective: To develop methodological technique for the assessment of change patterns of the effectiveness of oil recovery depending on the size of already exhausted sections and stress-strain performance of oil reservoir. The experience of oil development shows that configuration (size) of operating area as well as flow coefficient of oil reservoir are considered to be within the key factors determining the rate of oil recovery, regime and parameters of injection and pumping as well as the design of well location. The increase of occurrence depth, extent of faulting, gas content along with the decrease of thickness leads to decrease of water-transmitting capability and consequently effective operational radius is also declining while the pressure and pumping time are increasing. Given other conditions being equal the denser network of injection wells as well as more powerful pumping equipment is required for the development of oil reservoir with low water-transmitting capability. This causes higher capital and operational costs resulting in lower economic efficiency of oil extraction. The alternative option is to apply software in order to model the parameters of well network. Methodology: Boundary-element method (BEM) is fundamental for the stress-strain analysis of oil reservoir considering the natural and man-caused compliance; effective numerical algorithms and software, testing of software package are applied. Results: The upgrading of software package “PRESS 3D URAL” that enables automation of calculations and include processing unit of raw data, unit of numerical analytic calculations, unit of the results processing aimed at visualization and analysis. Implementation of the component technology enables the differentiation of the objects as well as its properties within the operating area. The correction factors are proposed that permit the adjustment of parameters of the production and injection wells network (radius of effective oil reservoir treatment) for the sections with different stress-strain performance for the sake of enhancement of oil recovery rate. Discussion: Implementation of the proposed methodological technique for the assessment of parameters of wells network within the development of oil fields provides more reliable forecast of oil extraction indicators, enables the enhancement of oil recovery rate as well as the effectiveness of oil production. Key words: oil recovery, well network, effective oil reservoir treatment, software package, economic effectiveness. The oil reservoir is being compressed by ground pressure which is determined by the occurrence depth, the density of overlying rocks, etc. During the operation of the wells, the pressure in the bottom-hole formation zone decreases while the effective pressure increases that can lead to a change in the permeability and porosity of the bottom-hole formation and, as a result, may cause a decrease in well productivity [1-6]. The existing experience of oil development shows that configuration (size) of operating area as well as flow coefficient of oil reservoir are considered to be within the key factors determining the rate of oil recovery, regime and parameters of injection and pumping as well as the design of well location. The increase of occurrence depth, extent of faulting, gas content along with the decrease of thickness leads to the decrease of water-transmitting capability and consequently effective operational radius is also declining while the pressure and pumping time are increasing. Given other conditions being equal the denser network of injection wells as well as more powerful pumping equipment is required for the development of oil reservoir with low water-transmitting capability. This causes higher capital and operational costs resulting in lower economic efficiency of oil extraction. The alternative option is to apply software in order to model the parameters of well network. Such methodological approaches as the method of finite elements (FEM) and the method of boundary integral equations have become the most applicable in the mining (oil & gas) industry for calculating the stress-strain performance of the rock massif, as well as for modeling the hydrodynamic problems. This concerns both planar problems and, in recent years, spatial problems related to the calculation of stresses and strains in a rock massif. Herewith, the use of numerical methods for solving differential equations has been considered as the most effective. However, the application of the method of numerical finite element (FEM) within the three-dimensional problems is very time-consuming, especially in terms of splitting the space into finite elements, determining their conjugation, preparing the initial information as well as performing the analysis of the obtained results. Therefore, the effective application of a particular calculation method depends on the deep understanding of the specific nature of the problem being solved. Under the context of mining (oil & gas) industry one should keep in mind that the accuracy of the calculations will depend on the quality of the initial information provided by the various services of the mine site (mine surveying, geological, hydrogeological, etc. ), design and research institutes. The performed researches have shown that the method of boundary integral equations can be considered as the most appropriate one for the current and prospective forecasting (monitoring) of the strain performance of the rock massifs under the context of considerable size of an operating area, as well as for the geomechanical justification of the well network parameters. As a result of the conducted studies, it was decided to adapt the software complex "PRESS 3D URAL” [7-8], which incorporates several data processing blocks (preprocessor, processor and postprocessor)in order to solve the problems of oil and gas industry. For the sake of solving regional problems, the automation of the process of initial information preparation is becoming particularly important, since it allows substantial reduction of the labor and time costs. At the same time, strict requirements are imposed on the created database of objects in order to correspond to the accepted calculation method of the processor (computing) unit. Consider the use of the software complex "PRESS 3D URAL" to assess the stress-strain performance of a variable-capacity oil reservoir and the effect of rock pressure on the effective distances between producing wells (Fig. 1). 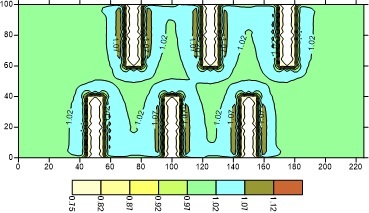 The preprocessor block of the software "PRESS 3D URAL" is based on the technique of covering the plan of oil extracting operating area (Figure 2) with an electronic grid of boundary elements (Figure 3), which are objects with a set of unique properties. Thus, the oil reservoir is divided into many independent objects, each of which has unique properties. A technique for assessing the stress-strain state of an oil reservoir. Analysis of the geomechanical state of the rock mass shows that the diversity of mining-geological and mining-engineering factors significantly affects its stress-strain performance. The analysis of the patterns of stress distribution in the oil reservoir caused by the influence of a wide range of factors can be performed using the calculation technique given in [9-11]. If there are zones of unloading or zones of increased rock pressure in the oil extracting operating area, the distances between production wells Rproject that are generally taken without taking into account the influence of rock pressure, should be adjusted according to the recommendations set forth in . Considering all the above stated methodological aspects the software "PRESS 3D URAL" has been upgraded in order to perform subsequent computer modeling. The results of the evaluation of the effective distance between production wells. In order to perform the calculations, the following initial data were accepted: the width of the influence zones of oil-extracting works (S) is in the range of 10-40 m; the thickness of the oil reservoir (m) is in the range of 5-40 m; modulus of elasticity of adjacent formation and reservoir E is equal to 40,000 MPa; Poisson's ratio of rock material (v) is equal to 0.3. The main design scheme is presented in Figure 2. The main stages of the simulation are shown in Figure 3. The calculation results of the stress-strain performance of the oil reservoir, as well as the correction factors adjusting the distance between production wells, are given in Table 1. 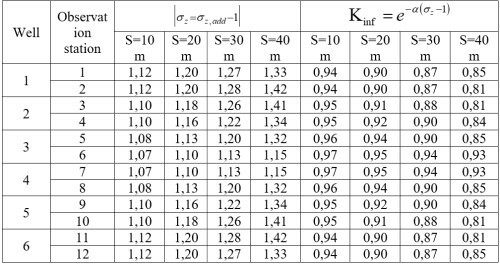 Calculation results of the effective distances between production wells adjusted by the correction factors K, are given in Table 2. Analysis of the obtained results. Oil production in the areas of low thickness of the reservoir (m = 5 m) leads to the emergence of overload zones within the untreated area between adjacent operation wells with a strain concentration exceeding 1.1-1.4 times the strain of the virgin rock mass (Table 1). With the increase of the thickness of the reservoir, its influence is decreasing and at m = 40 m the strain performance does not exceed 10-15% of the strain in the virgin rock massif that is associated with considerable compliance (deformability) in the oil reservoir. Increase in the width of the pumping zone leads to additional increase in the strain concentration within the untreated sections of oil reservoir between adjacent operation wells by an average of 10-15% with an increase in the width of the treated section of the oil reservoir from 10 m to 40 m (Table 1). Thus, in order to take into account the increased level of strain appearing in the untreated section between adjacent operation wells caused by the increase in the size of the pumping zones, the decrease in the size of the untreated zone and in the thickness of the oil reservoir, the distances between production wells should be adjusted (Table 2). Meanwhile, the reduction of the effective distance between adjacent production wells can be 30% or more in comparison with the initial project designed without taking into account additional rock pressure. The performed research has provided theoretical contribution to the assessment of the stress-strain performance of oil reservoir under the context of oil well pumping. The analysis of the patterns of the strain performance changes emerging within the untreated sections of oil reservoir enables us to conclude that low thickness of the reservoir can be considered as the most challenging environment for oil extraction in terms of strain performance changes. For the sake of improvement of oil production efficiency the research proposes to implement correction factors that enable adjustment of the parameters of the production well grid at the operating sites with different levels of stress-strain performance. 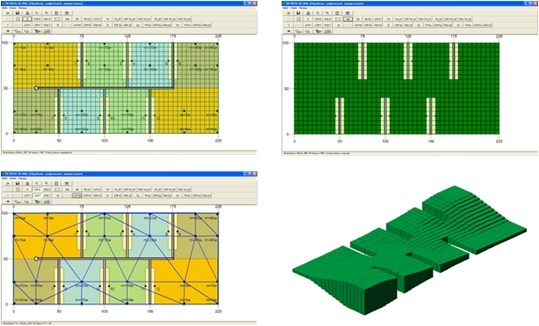 Is made the upgrading of software package “PRESS 3D URAL” that enables automation of calculations and include processing unit of raw data, unit of numerical analytic calculations, unit of the results processing aimed at visualization and analysis. Implementation of the component technology enables the differentiation of the objects as well as its properties within the operating area. The correction factors are proposed that permit the adjustment of parameters of the production and injection wells network (radius of effective oil reservoir treatment) for the sections with different stress-strain performance for the sake of enhancement of oil recovery rate. It should be noted that this research can be considered as a pilot study, therefore the proposed theoretical implications are preliminary by its nature. In order to get more specific practical recommendations for oil production at a particular oil field, it is necessary to carry out additional study aimed at getting deeper perception of physico-mechanical and filtration properties of rocks and ores. Economides M., Oligney R., Valko P. Unified fracture design. Bridging the gap between theory and practice, Orsa Press, Alvin, Texas, 2002, 262 p.
 Zoback M. Reservoir geomechanics, Cambridge: Cambridge University Press, 2010, 461 p.
 Fjaer E., Holt R.M., Harsrud P. et al. Petroleum related rock mechanics: Elsevier, 2008, 492 p.
 Hoek E., Martin C.D. Fracture initiation and propagation in intact rock –A review, Journal of Rock Mechanics and Geotechnical Engineering, В, V. 6, 2014, pp. 287–300. Kashnikov Yu.A., Shustov D.V., Kukhtinskii A.E. et al. Geomechanical properties of the terrigenous reservoirs in the oil fields of Western Ural. Neftyanoe Khozyaystvo - Oil Industry. N 4, 2017, pp. 32-35. Kashnikov Yu.A., Ashikhmin S.G., Shustov D.V. et al. In situ stress in the oil fields of Western Ural. Neftyanoe Khozyaystvo - Oil Industry Issue 5, 2016, pp. 64-67. Brigadnov I.A., Mozer S.P. Automation of the interpolation of pre-processor basic data for program complex «PRESS 3D URAL». Journal of Advanced Computer Science and Technology, № 2, 2013, pp. 59 - 67. Sidorov D. V. Primenenie avtomatizirovannogo programmnogo kompleksa «PRESS 3D URAL» dlya prognozirovaniya udaroopasnyh zon i parametrov zablagovremennoj skvazhinnoj razgruzki rudnoj zalezhi i celikov v slozhnyh geomekhanicheskih usloviyah. Zapiski Gornogo instituta, № 204, 2013, pp. 284 - 293. Rogachev M.K., Kondrasheva N.K. Reologiya nefti i nefteproduktov. Ufa: Izd-vo UGNTU., 2000, 89 pp. Fuks G.I. Vyazkost' i plastichnost' nefteproduktov. M.-Izhevsk: Institut komp'yuternyh issledovanij. 2003, 328 pp. Zamorkina YU. V. Geomekhanicheskoe obosnovanie parametrov podzemnogo vyshchelachivaniya rudy na Hiagdinskom uranovom mestorozhdenii. Markshejderskij vestnik, № 5, 2016, pp. 48 - 52.